We’re sure that this year’s Golden State Warriors-Cleveland Cavaliers NBA Finals won’t beat the average of the 1998 Utah Jazz-Chicago Bulls finals. 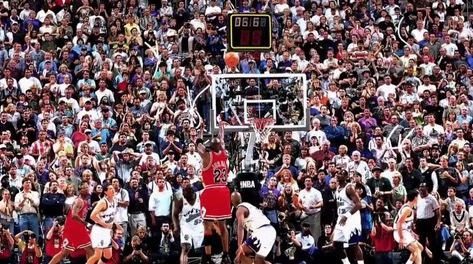 That series, Michael Jordan’s last in the NBA Finals, averaged 29 million viewers. But will at beat everything since then? We think so. The only series standing in its way is 2001’s Lakers-76ers series that averaged 18.996 million viewers on NBC. By winning Thursday’s game, Golden State deadlocked the series at two games apiece. That assured that the series will go at least 6 games. While it’s folly to predict viewership of future games — we proved that by predicting before the series began that it wouldn’t be more-watched than 2010’s Lakers-Celtics series — there’s an aspect that’s not crazy to predict: viewership of game 6 will be measurably higher than the average for the first 5 games. Based on recent history of series going at least 6 games, it’s pretty safe to predict it will be at least 1.25 times the average viewership for the first 5 games, and likely higher. We haven’t seen viewership for game 4 yet as we write this but if we assume game 4 does at least as well as game 3 (and game 4 had a higher overnight rating) and also assume that game 5 only does as well as game 3 then game 6 will average at least a bit over 23 million viewers. In that scenario the series averages around 19.4 million and eclipses the 2001 series. So with a six game series we think it’s very likely Cavs-Warriors eclipses the 2001 series to become the most-watched series since 1998. With a 7th game it’s a certainty. Update 1: Game 4 averaged 19.84 million viewers so through four games the average is 18.88 million viewers, so confidence in the prediction is even higher than when we originally wrote this.